The 90’s kids would fondly remember Denny’s- an all American Diner which introduced Singaporeans to the definition of American food. Who would have thought that fried chicken with waffles would have tasted so good? Or piping hot fluffy pancakes served with maple syrup and you could add a side serving of maple smoked bacon for that meaty goodness? 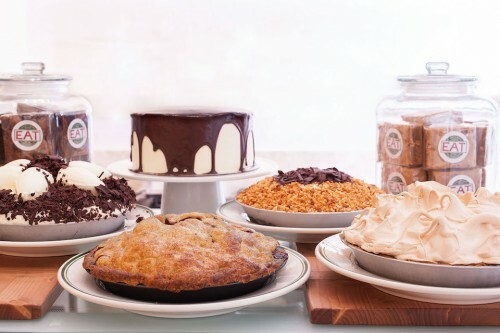 With Denny’s now a thing of the past, Metropolitant is excited to announce that Clinton St. Baking Company & Restuarant has finally launched in Singapore that true-blue American diner experience. 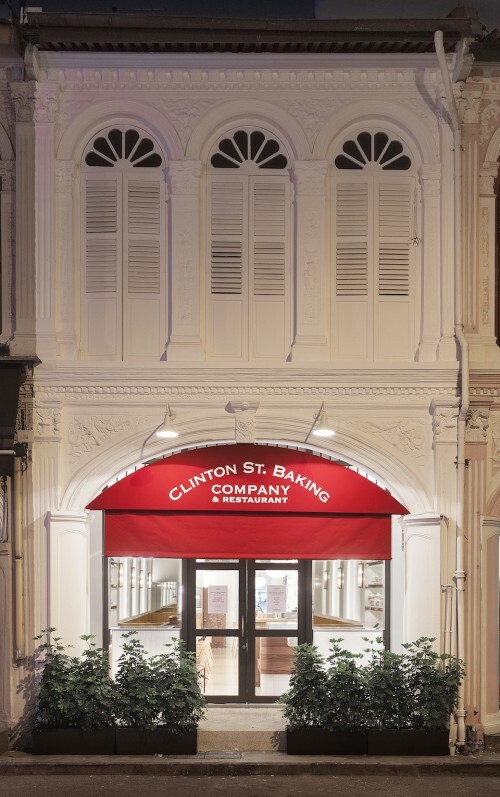 Founded by husband-and-wife team, Chef Neil Kleinberg and Dede Lahman, Clinton St. Baking Company & Restaurant now delights Singapore diners with all-star timeless American classics such as pancakes and Eggs Benedict. The duo started its first restaurant in the Lower East Side institution in 2001 and subsequently in Tokyo and Dubai. Customers who visit any of their outlets internationally can expect the same feel-good experience. Here, Metropolitant shall do a short review on their popular selling items, what’s hot and what’s not. 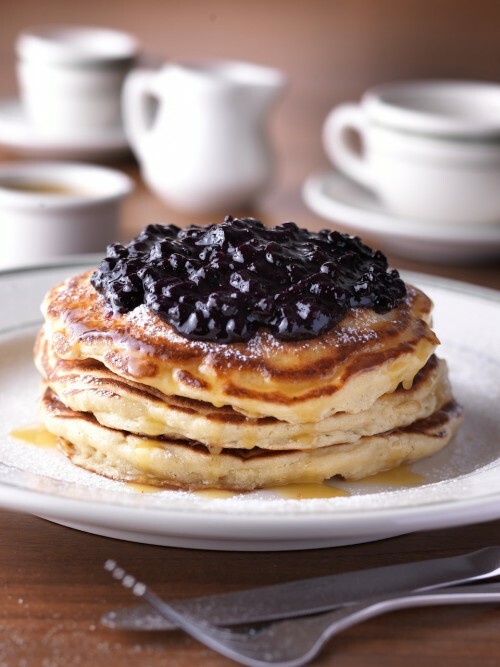 The All-Day-Breakfast menu starts with fluffy Pancakes with warm maple butter ($18) has been voted “Best in the city” twice by New York magazine and it achieves that light and fluffy texture by incoporating whipped eggs into the pancake mixture. Customers can choose from a variety of flavours from blueberries, banana walnut or chocolate chunk toppings for their pancakes. This was definitely the best pancakes we have tasted and we aren’t big fans of sugary sweet stuff,we had some resistance towards the maple butter. However, we were wrong as the maple syrup was not as sweet as those sold in supermarkets and the maple butter incorporated into the maple syrup was just the best thing we ever had. Next, the Southern Breakfast ($18) – consisting of two eggs any style, maple cured bacon, cheese grits and fried green tomatoes with panko crumbs.The cheese grits are made with two kinds of cheeses – cheddar and Monterey Jack which is something not typically found in our local American diners. We felt it tastes like nicely made oatmeal with a savoury twist. The fried green tomatoes were very interesting and did not taste sharp unlike the red ones. The maple cured bacon was fried to a good crisp and were not charred. 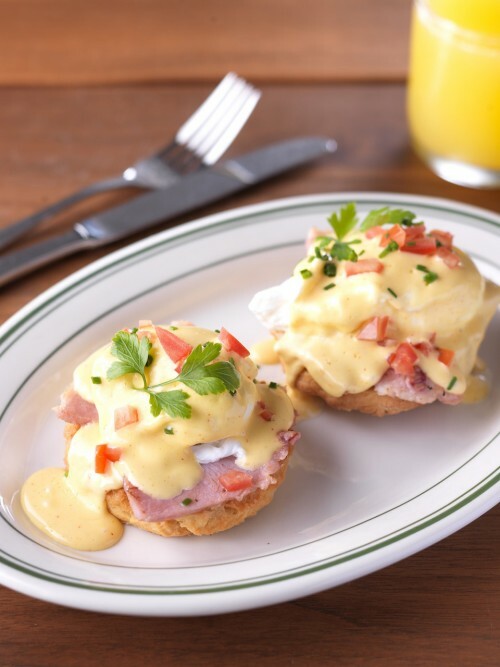 Finally, the Eggs Benedict ($18) took Singapore by storm in the past 2 years and now a staple on every breakfast menu. 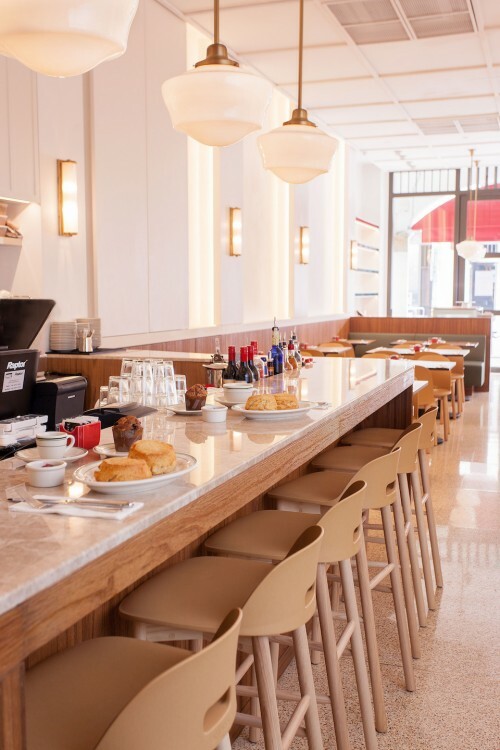 Instead of serving the eggs on a warm toasted English muffin, Clinton St. Baking & Restaurant takes it up a notch by serving thickly sliced maple-cured ham on a toasted buttermilk biscuit! We recommend that you order this dish with a ravaging stomach or do share this with a friend. The hollandaise sauce was generous and complemented the maple-cured ham very well. The buttermilk biscuit provided a good crunch when coated with the runny egg yolks. Definitely an extremely sinful dish and provides a good excuse to thwart your diet plans! Clinton St. Baking & Resturant do serve sides for sharing such as the House-cured salmon ($12.50), Rosemary Pork Sausage ($7) and Hand-cut Fries ($7). The servings for all their items is appropriate to suit Asian appetites as compared to the American sizes. 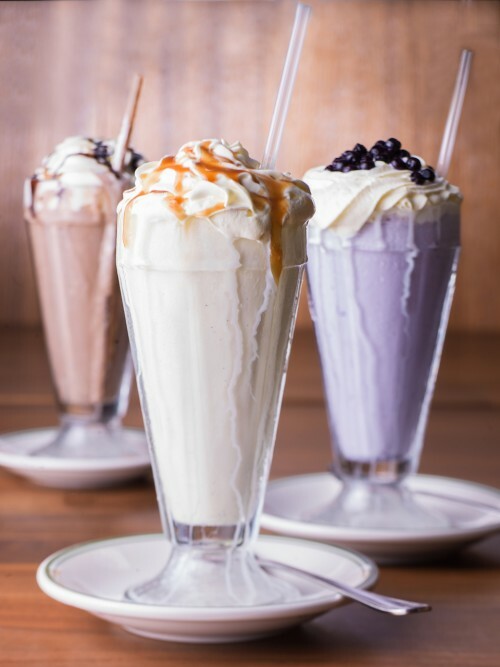 If you do have room for one more item, please do try the American Shakes ($10 – $15),the milkshakes are donned with strict proportions of milk, cream and ice-cream so it is smooth in consistency and easy to savour without being too watery. 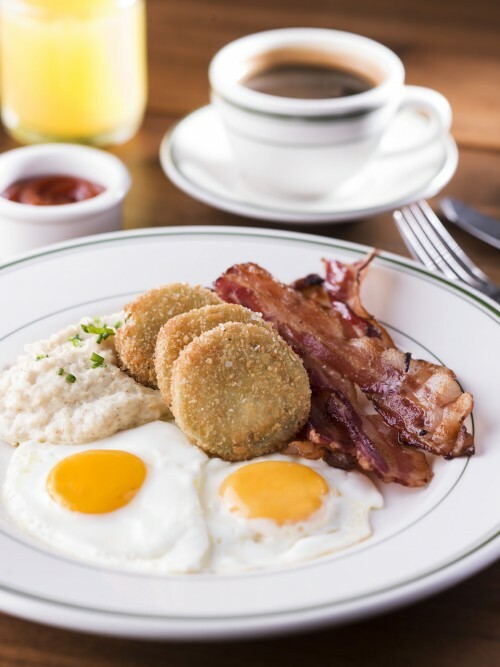 Metropolitant recommends trying the pancakes and the classic Southern Breakfast for first-timers. Do make a second visit for their Chicken & Waffles ($21) and probably their good selection of home-made cakes ($9.50 per slice). Unfortunately, they open till 6pm daily as of now so do make a trip down in the day! The Body Shop Presents The Feel Good Wonderland this Christmas!